The Singing Quilt is the third book in the contemporary fiction “Quilt” series (The Doctor’s Christmas Quilt, The Moses Quilt) written by award-winning author Kathi Macias. 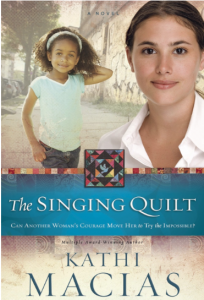 NOTE: The Singing Quilt completes the series, which focuses on various social issues, including racial and pro-life issues. BONUS: Supplemental online book club materials will be available at NewHopeDigital.com. When we asked Kathi Macias why she wrote The Singing Quilt and what she hoped Readers would gain from reading it, she said . . . This entry was posted in Inspirational, Social Issues, Uncategorized and tagged Clean Read Books, Inspirational fiction, Kathi Macias, Recommended Reads, social issue fiction, vicki hinze. Bookmark the permalink.